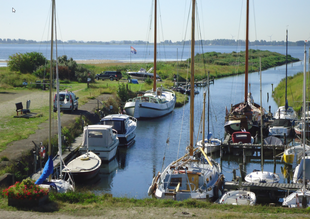 About 3 km east of the Marina of HERKINGEN is Ressort Battenoord , just behind the dike of Lake Grevelingen. Ressort Battenoord is a very small park of about 1.5 HA. There are a total of 18 (holiday ) homes built. There are NO facilities for children at the park or other facilities. When you walk about 10 min, there is CAMPING de Grevelingen, where -after consultation- it is possible to use the facilities for children. Some of the houses are located behind the dike , some of the houses look over the landscape. The Ressort Battenoord is named after the little village Battenoord. 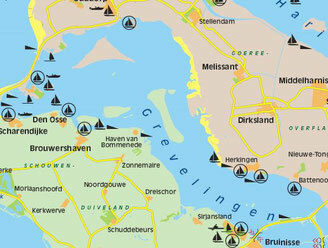 The Grevelingenmeer is the purest salt water lake of Europe, and consist of approximately 7000HA of water. 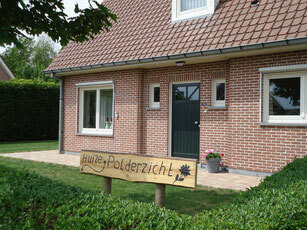 The surroundings of Battenoord is very suitable for lovers of peace and quiet, nature and space. Behind the dike is also a little harbour . to go on the Grevelingen from this little harbour. Here can you see a short video, which is made above Battenoord. Left in the picture , just below the wing, is Park Ressort Battenoord.